Ive been battling pedal feel issues for a few years now since I've put the brakes on. The first motion of the pedal I have nothing, maybe a little braking then I start to get braking. I get full brakes at the very end of the pedal movement. Ive tried a few different known good boosters, tested with a mittyvac pump to check of leaky seals and Ive switch over to the mustang master cylinder. Generally I dont complain in dry condition, I have great breaking other then the pedal feel. When its braking in the wet, tires just lock up, same ****ty pedal feel or lack of pedal like in the dry condition then brakes just lock up unless you gingerly apply brakes. What are other peoples pedals feel like with the R brakes on the front and the mustang master? what bore master does the rb use? So you had the same issues with the stock old Volvo MC and then a new Mustang MC? Have you already played with the pushrod adjustment? What is the piston size(s) on the calipers? I found this on VIVA's site. I had this same problem with my mazda rx7 brakes with stock Volvo MC when I went from manual to auto then same issues with the Volvo R front calipers. This was also with a new volvo stock master. Yes, but this has been in the back of my head. do you have a build thread on the brakes? If you're adjusted fully outwards and it's still not enough, here's what Marv did (Similar to Homer when he ran the Porsche Calipers IIRC). Do note that Marv is running the Cadillac ATS style Brembo calipers on the front of this car(wagon), though. I figured it's worth mentioning before getting further into the system and having to deal with bleeding the brakes a few times. Turns out all I needed was a small rod coupling on the brake booster rod. The stock rod is too short to actuate the mustang master cylinder. Id probably bled a gallons worth of brake fluid through the brake system thinking i had the process wrong or that there was somehow still air in the brake system. The stock rod on the booster is sae thread so I was able to find a sae to npt stud at my local ace hardware. So purchased a new stud and then a 3/4" length rod coupling gave me the needed length to actuate the master cylinder when I pressed on the pedal. Finally, a stiff brake pedal. I spent yesterday evening playing with the rod length. It was too long at first so the brakes were dragging. That's one way to bed in the new pads i guess. But I was able to get it really dialed in. Ah, word. I'm pretty much just echoing what freevolvos is saying though so, cheers. Unfortunate that the problem may lie deeper. I realize many of us are asking 'problem obvious' questions....but, here we are. Did you bench bleed MC's when you replaced them? The rod length is important to get right. 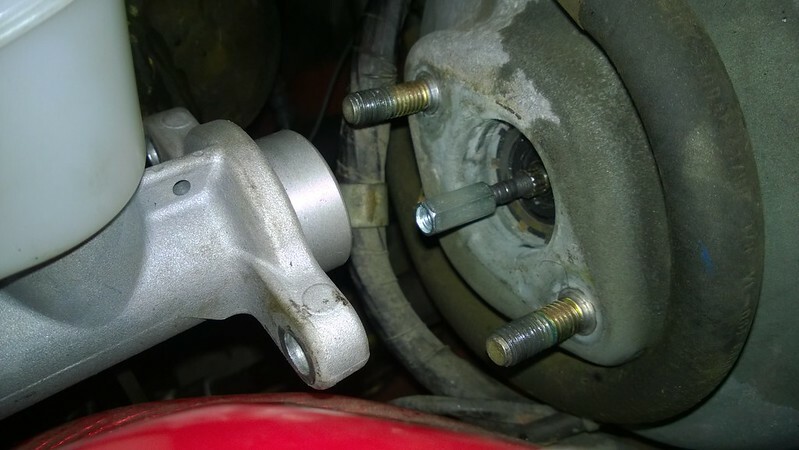 If you haven't you need to replace the adjustment screw on the end of your brake booster rod. The stock rod isn't long enough to work with the mustang master. EVERY progressive has smaller piston FIRST...because as a n AP Racing injur-near once siad "First piston gets a nicer "bite" on the disc with longer pads so 1.5" first, then the trailing at 1.625"
We did the math and we think I that I bought the wrong bore size mustang master cylinder comparing the stock 240 one vs. the s60r/v70r the one I have is too small so I've ordered a 1-1/16th inch bore. I will say my pedal is a little touchy. Not lock the brakes up touchy, but someone that hasn't driven the car will find the pedal sensitive. Same experience. Ended up switching to the earlier, smaller, single-diaphragm booster and think it is just right with the mustang master and caddy calipers. Do you know approx what years I should be looking at for this? I got mine from Rockauto, A-1 CARDONE 535890, that was for a 1977 240. Looks like they are currently out of stock though. Maybe one of the fellas that services the wanted adds on here will have one on their shelves? Mine is the opposite of that. I have the new mustang master here with the bigger bore but have yet to install. Im still in the middle of a custom wooden barn door build. Hoping to get to the swap in a few days. When I tried using a larger that stock master cylinder (Ford F-Series) on my 88 765 with Jumbo brake upgrade the brake pedal was nearly impossible to press, the pedal was rock hard. I installed a 2000 Ford Ranger master cylinder with 1.0625 inch bore and it was a good option. A 1/16 inch difference in bore size makes a huge difference. I also learned that the 700/900 cars with Jumbo Brakes used a brake pedal with a different ratio. So matching the brake pedal ratio to the master cylinder is a good idea.